After two weeks of brilliant submissions, Bollyshake, along with Deepika Padukone have chosen FOUR Desi Dance Network members as finalists! Nova Nassa is Villanova's first co-ed fusion dance team. Nova Nassa combines elements of classical Indian, Bollywood, and hip-hop dance styles to a blend of beats from Indian roots fused with the modern hip-hop of our Western culture. In their rendition of Bajirao Mastani, Nassa's Halloween-inspired video incorporates elements of Ballroom, Hip Hop, and moderm in their haunting Bollywood choreography. Having already won a competition two weeks ago and placing second at another, you can expect to see much more from Nova Nassa in the near future! Tosha Patel and Divyanka Gupta are first year members on Jalwa. Jalwa is Boston University's premier co-ed fusion dance team specializing in hip-hop, bollywood, bhangra, contemporary, and charisma. Having not even competed yet in the Bollywood Fusion collegiate dance circuit, Tosha and Divyanka are already dancing up a storm in their beautifully choreographed classical-fusion number. This number showcases two girls vying for the attention of the One through their love of dance. Neelam's submission combines Bollywood choreography with a twist of contemporary. In this number, Neelam deliberately plays with the different accents and levels in the music to create a stunning piece. Anisha Babbar is an alumna of UC Berkeley and Azaad. UCB Azaad, referring to "independence or freedom", is excited to bring a fresh, new taste of Bollywood to Berkeley! The team is based on dedication, passion and energy, with the primary goal of creating productions that entertain and motivate audiences to connect with the Bollywood culture. In Anisha's cover of Deewani Mastani, she effortlessly weaves powerful movements into softer Bollywood contemporary choreography. With multiple technical turns and innovative floorwork, Anisha's choreography has earned her a spot as a finalist. It is not too late to enter! 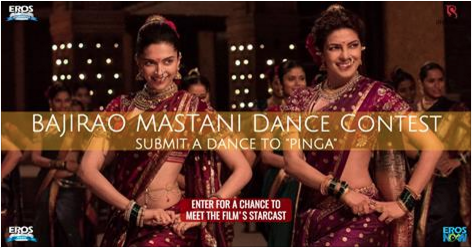 If you would like to a chance to meet the starcast of Bajirao Mastani, start dancing to Pinga today and upload your submissions to Bollyshake! We've seen some stunning Deewani Mastani performances so far; now let's see what you've got for this song! Contest ends on 11/30 (for Pinga). Additionally, Bollyshake has some special prizes exclusively for DDN. The Top 5 videos with the most likes on Bollyshake will receive free movie tickets to #BajiraoMastani opening weekend (2 tickets for every dancer in your video).